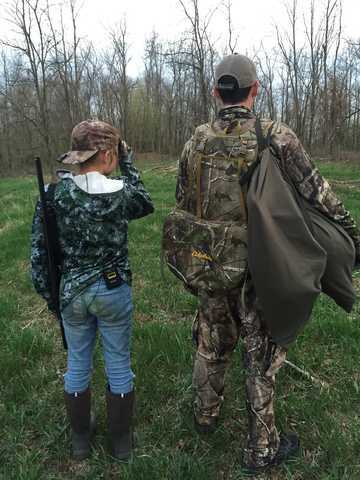 A proud dad's first hunting adventure with his daughter in Ohio for the youth spring turkey hunt. 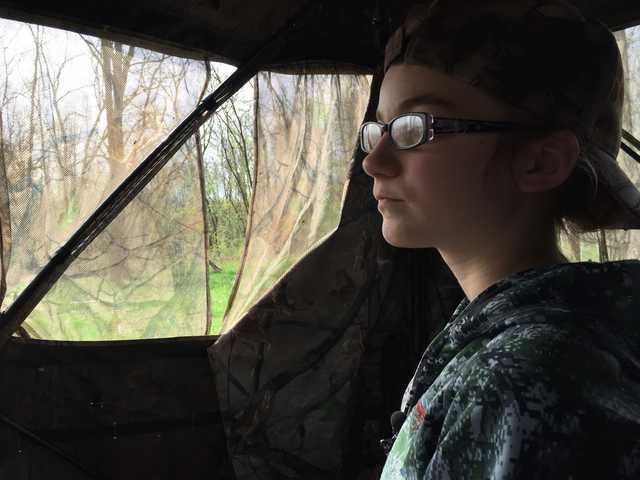 After a tough day of travel from Austin to Ohio via Pittsburgh (weather delays), I was able to meet up with my 12 yr old daughter, Amorelle, for an afternoon turkey hunt near Cadiz, OH. She was visiting the east coast and came to OH with her momma and grandfather. I love this kid! 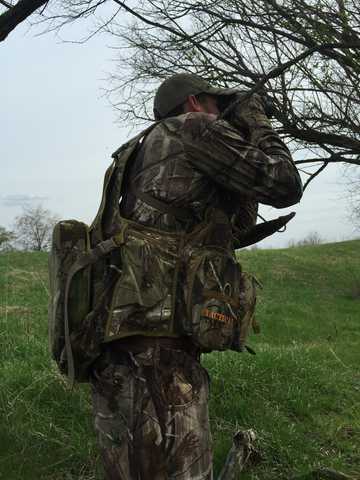 As soon as we pulled into the lease, our guide, Jerry, spotted 3 strutters out in an open field. 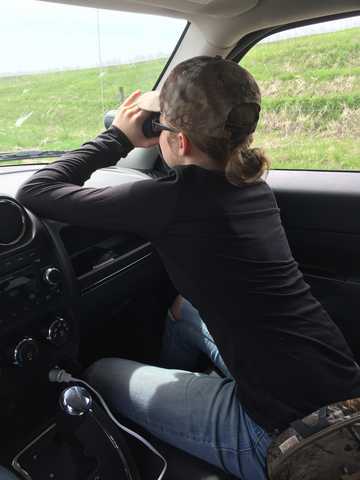 Amorelle grabbed my binos and started to get in the zone. Jerry and Amorelle survey the situation and consider the best way to get close enough to the 3 toms that were hung up at around 100 yards. "I'm going to setup the decoys in this field, and we'll see if we can get them to circle around the little hill in front of us...like this. 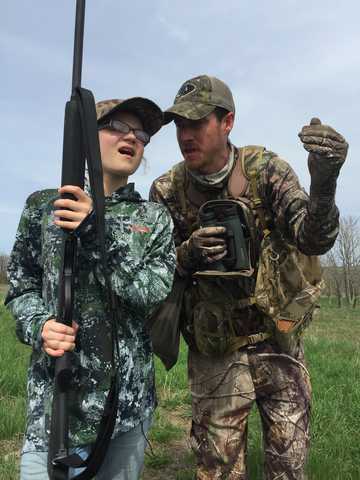 Wait here while I get the decoys in play, and then we'll find a place to get you setup for an ambush." 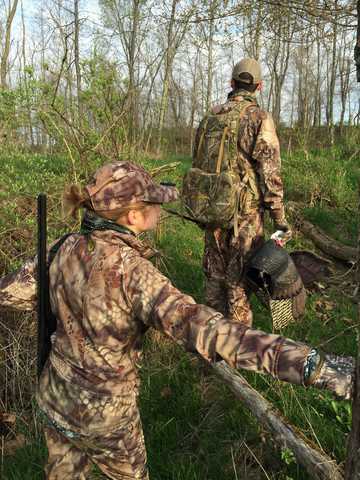 Amorelle keeps a close eye on the turkeys while her guide deploys the decoys. She has her game face on for sure. My Sitka hoodie is a little big on her, but she's wearing it well :). Amorelle finds a nice bush to hide behind, and her guide creates a make-shift shooting stick. 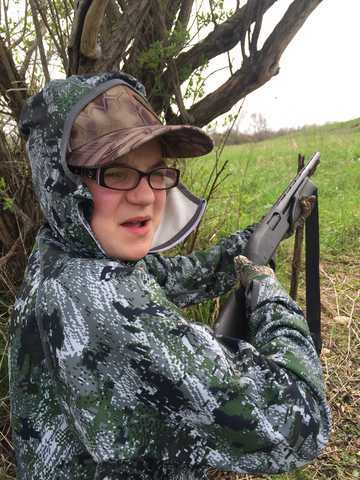 Getting comfortable with the shooting lanes with her Remington 870 compact, 20ga. 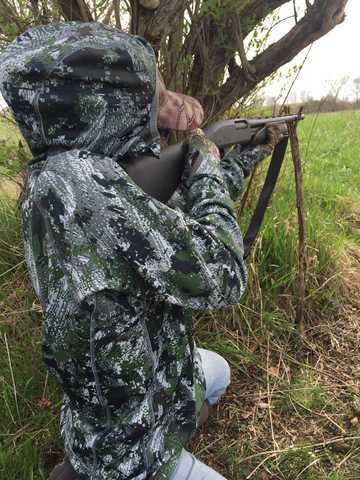 Her first gun she got for her 12th birthday. Shooting 3" #4 shot. After 20 min of calling, we couldn't get the Tom's to budge. They had 1 hen with them and another joined them. They were playing the "You come to me - I'm not coming to you!" game. Frustrating. Jerry surveys the situation and we decide to grab the decoys and do a belly-crawl up the hill to get closer. Amorelle hides in the grass beside a hen decoy, and watches the strutters in the field for another 30 min. It was exciting! The cameraman said he could hear her heart beating quickly through her microphone. "Daddy - I see the one I want. That big one to the right. 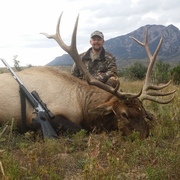 Holy cow...I've never been hunting before, but I LOVE THIS." We called again, but no luck. Those Toms wouldn't budge from their growing flock, as a few more hens joined them. As a last ditch effort, we decided to charge the flock, which was hung up at around 70 yards - just out of range. That went about as expected - with turkeys sprinting away quickly. 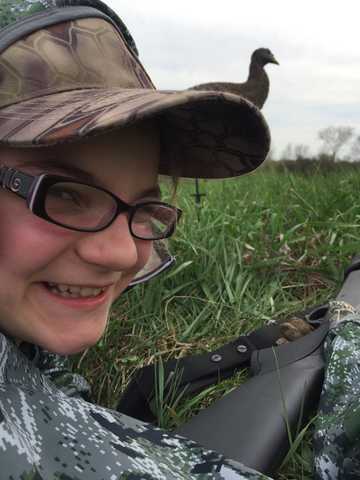 No luck this time for Amorelle, but what an exciting hour of turkey hunting after just pulling into the lane! 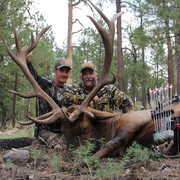 Amorelle and Jerry pose for the camera to recount the story of the hunt. 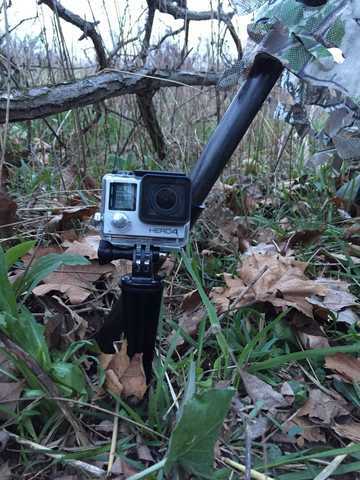 Wade James, a Sitka Gear pro staffer from Johnstown, PA, is behind the lens. After getting 3 hours of sleep, getting up at 4am, and hunting hard all day so far, the turkey huntress is exhausted. 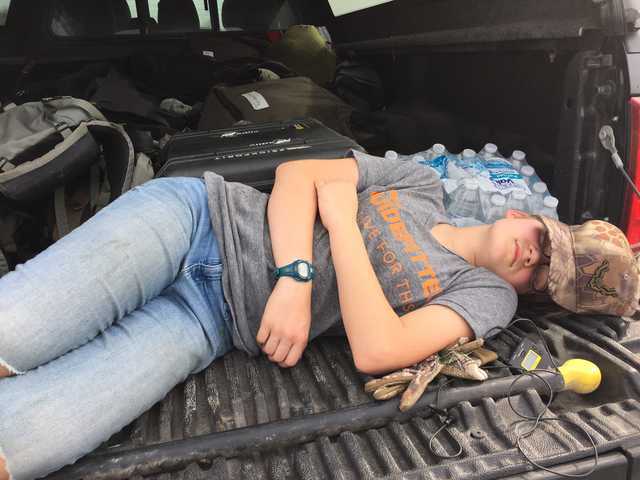 Amorelle takes a quick cat-nap on the tailgate of Jerry's Ford F-350 in the field. It was a beautiful Spring day in Ohio, unseasonably warm and perfect for turkey hunting. Am and Jerry take some time to consider options for one more attempt on the first day, before wrapping up. We ended up getting 2 more gobblers talking to us, with one of them getting within about 60 yards in some thick timber. But no luck - we couldn't get them to close the gap to get into shooting range. No luck day 1, but Amorelle had an incredible time and we saw around 50 turkeys, with plenty of them strutting and shouting at us. Me - "Hey Am...except for on TV, you've never seen anything like this before!" Am - "Dadda - this is WAY better than TV...holy cow." Day 2 of the hunt, and another early morning. The second morning, right at daybreak, and the area erupts with thunderous gobbles from all directions. We setup the decoys in an open field, on a ridge where we saw a small flock the night before, and get Amorelle setup in another sniper's nest. The morning was much colder and lots more wind than the day before. This is probably going to effect the day, but we'll see. 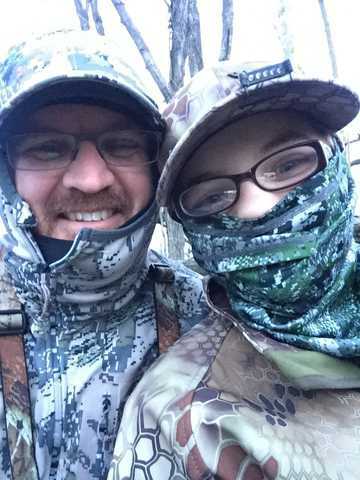 Dad and daughter pose for a quick camo-selfie. 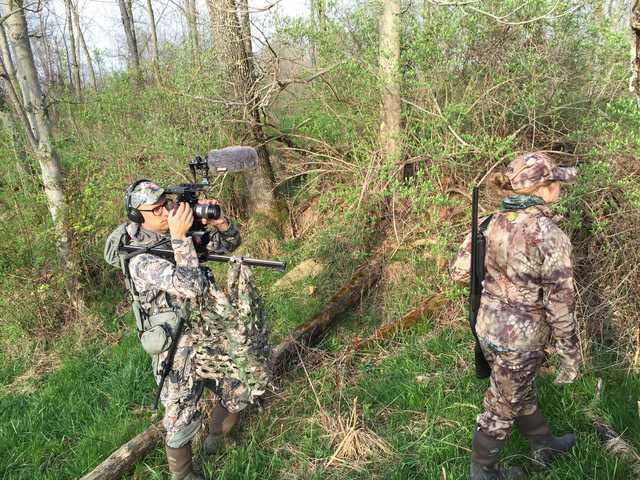 It's tough enough to hunt turkeys in the spring solo. But when you have a dad along with you, your guide and a cameraman with all the camera gear and gadgets, it's way more difficult. But Amorelle loved the opportunity to be on camera and play movie star for the weekend. She ate it up. After calling and waiting it out for about 1.5 hours, we decide to make a move. Before we did, Jerry said, "We should probably just stay put...making a move now is probably a mistake, but let's do it." Exactly 5 steps later, Jerry pauses and sees a Tom coming in hot to the decoy, at about 80 yards. We blew it. As soon as the Tom saw us, he bolted...in the other direction. So we packed up our gear, and our pride, and moved to a new location. The birds went quiet as soon as the sun came up. And we have no idea why. The morning's thunderous symphony of gobbling turkeys was now completely quiet. We were driving blind, but tried out a few spots with no success. 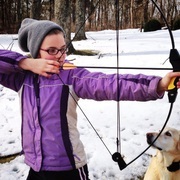 Amorelle learned a valuable lesson about hunting. Some days are hot, some not so much -- like this one. We thought for SURE we'd find success early on day 02, after seeing so many turkeys the first day. On our second day of the hunt, we're joined by yet another cameraman. 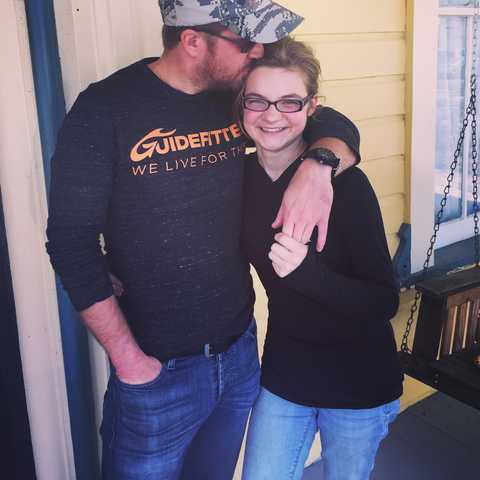 This time, it's Tyler Hock, producer for Guidefitter TV. 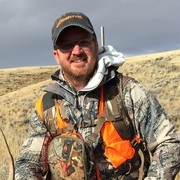 Here, he grabs our guide, Jerry, for his thoughts on the morning, right after blowing it with the gobbler who was silently coming into our decoys. 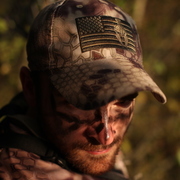 Wade stays focused on Amorelle as we walk through the brush to another ridge to try our luck with the gobblers. Perfect hunting grounds in Harrison County, OH. Near the large pond, we spotted several turkeys making their way through the brush, silently again. We hid in the shadows for about 20 minutes hoping to spot them, but no luck. A black cat walked in front of us -- a sign of the bad luck we would have the rest of the day. 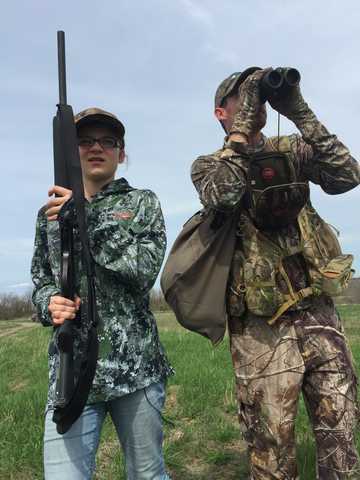 Wade and Tyler take time to capture thoughts from Jerry and Amorelle before moving on to a nearby blind to wrap up the morning hunt. 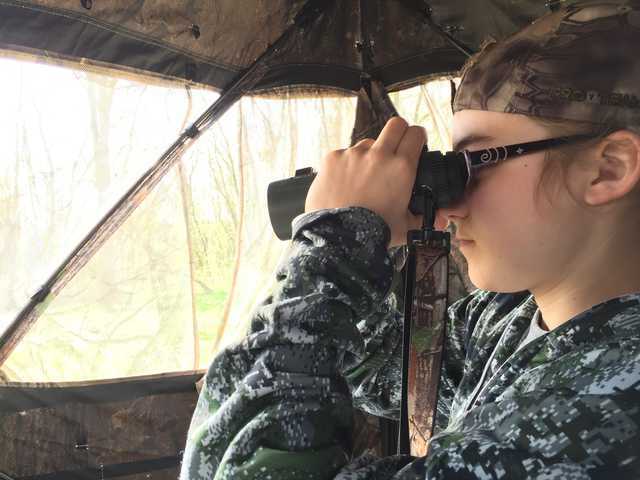 After calling for about an hour in the blind, and hearing nothing, Amorelle glasses the surrounding area to try to spot turkeys who may be approaching silently. She also learned the lesson from this morning -- turkeys don't always gobble when they move! Down to the wire on the last day of the hunt, and Amorelle is realizing she's probably going home empty. You can see the disappointment in her face, but this won't be the last hunt. 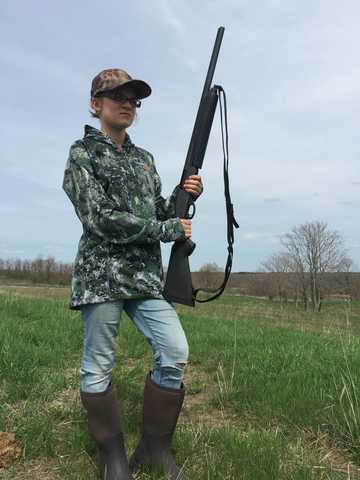 She hunted hard, and we never got her into gun range. And don't worry, she gave her guide plenty of grief for that ;). 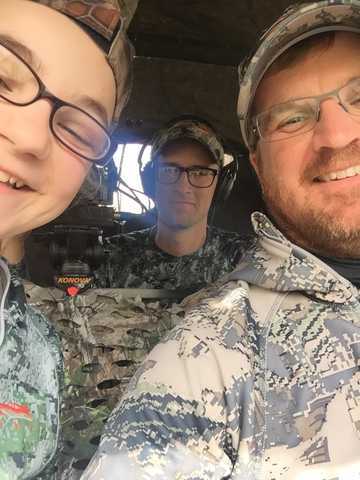 Another selfie in the blind, photobombed by Wade the cameraman. 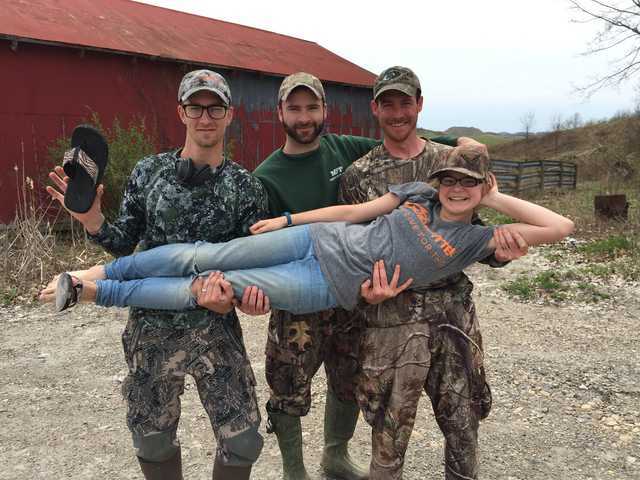 Alas - no turkeys on her first hunt, but Amorelle had a blast and takes some time here to ham it up with her guide, Jerry Blake, Guidefitter TV producer, Tyler Hock, and cameraman Wade James. 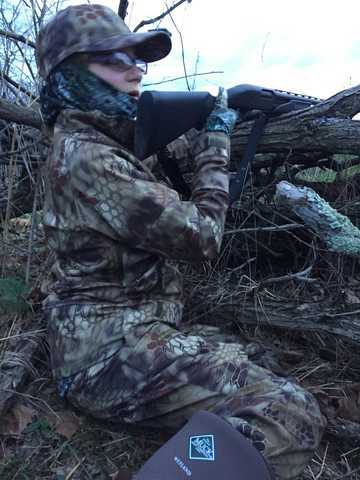 I'm looking forward to many more hunting adventures with Amorelle. More than anything, it was a treat to spend some time together, experiencing something few ever get to see and not worrying about the world for a few days. That's awesome! That 4:00 am smile pic is priceless. Dad, you've got a good one there. Nice job, Amorelle. Looks like you kept those boys in line. Had a blast with you guys! What a fun and exciting hunt!